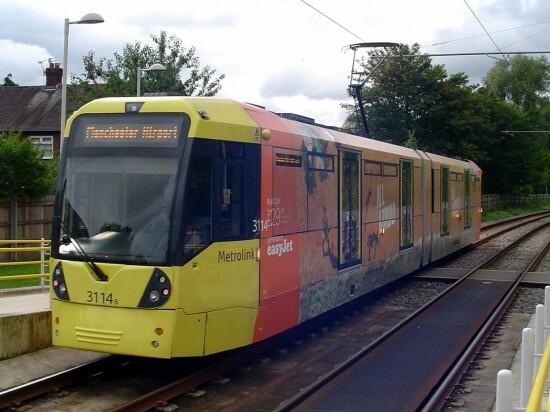 It seems that new adverts on Manchester Metrolink often come in multiples and that is certainly the case again. Last week we reported on the application of a new advert for Easy Jet on 3052 and now 3114 has entered service with a vinyl wrap for the same sponsor whilst 3018 has returned to Call of Duty for the second year in succession. The Easy Jet advert on 3114 is different to that on 3052 as instead of a pool it features a beach but again encourages people to get “All Abroad”. 3018 is again advertising Call of Duty – having previously advertised a release in this gaming series back at the tail end of 2017. This time it is Call of Duty Black Ops with a very dark vinyl wrap. And yes, contravision does feature once again. Meanwhile 3103 is back in the ranks of fleet livery with its vinyls for Hits Radio now removed. 3018 is seen at Victoria as the back unit of a double heading to Bury on 6th October. 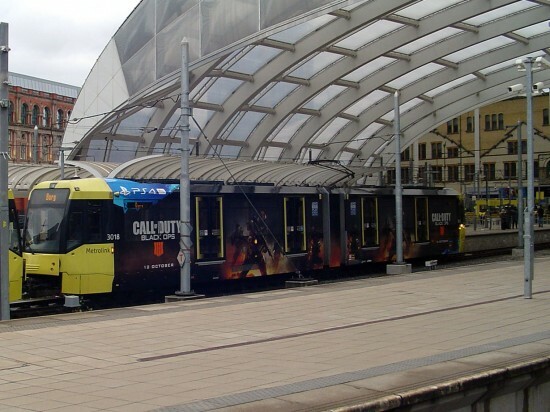 This is the second advert for Call of Duty that this tram has now carried.